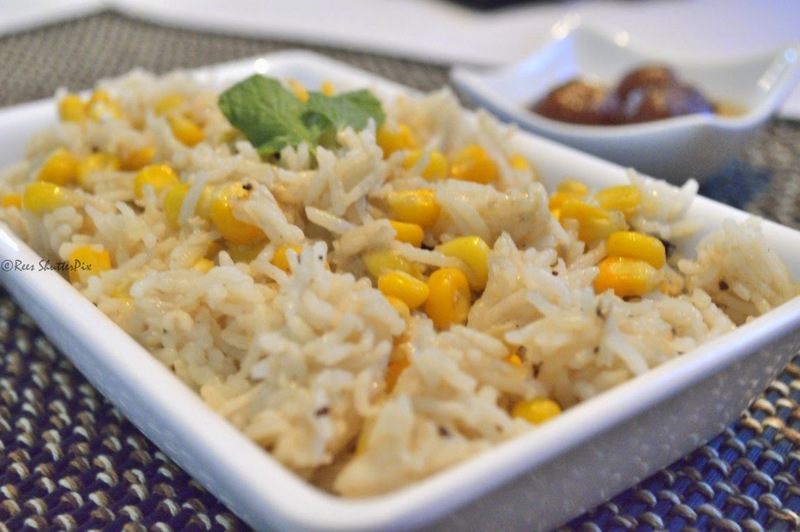 Sweet Corn Pulao is a simple, mild and flavourful one pot meal ready in minutes and makes a good lunch box meal for kids. 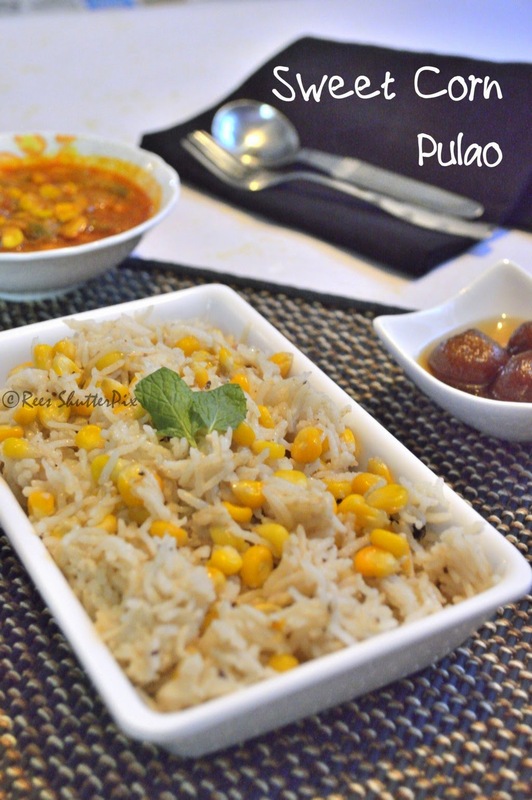 Sweet corn pulao can be served with baby corn fritters, chilli paneer, chips, or simply plain raita. Simple ingredients to a very aromatic rice!!! 1. Soak basmati rice for 20 minutes maximum. Drain and keep aside. Wash the sweet corns and keep ready. Grind the coconut with water and extract coconut milk of required quantity for rice. 2. Make a coarse powder using mortar and pestle. Heat oil and ghee in a pressure cooker. Add the items under "To temper" and saute well. 3. Add the sweet corns and allow it to cook in water by closing the cooker lid without whistle for few minutes. 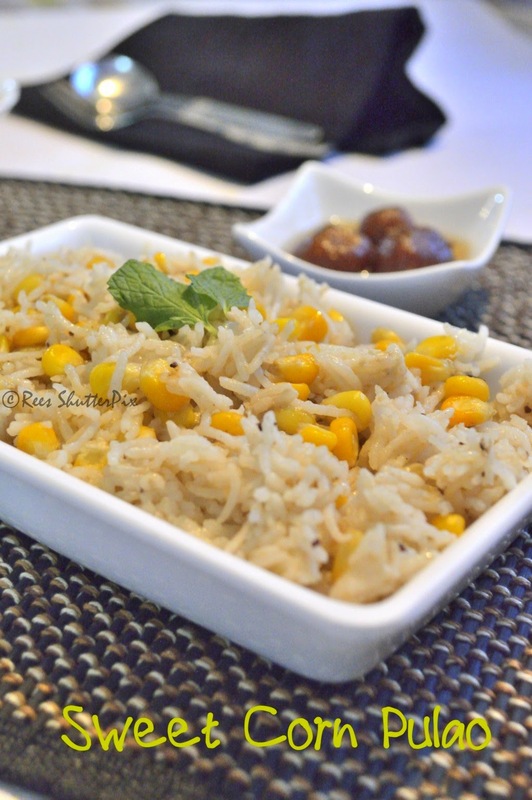 Remove and add the basmathi rice and saute well. Add the coconut milk. Check salt and pressure cook for 1 whistle and simmer over 5 minutes. Open once the steam is realeased. Check the rice using a fork. You can also garnish the rice with ghee fried cashew nuts, mint leaves and pepper powder. Adjust the quantity of sweet corn as desired. Add coconut water quantity to suit the basmati rice you cook with for separate grains. Linking it to the events: "MyKitchenOdysseyEvent" and Linking it to Kids Lunch Box Recipes by Indus Ladies A great event through which we can get lots of ideas for kids lunch box recipes!!! looks too yumm...with the coconut milk i'm sure it tasted delish ..sweet corns n coconut milk is awesome together.. 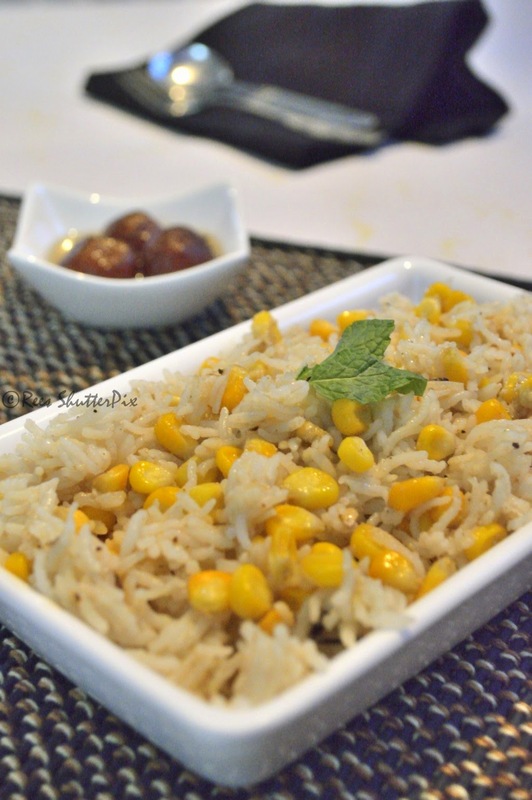 Simple but delicious corn pulao! !